I’m sure given my name, most literary minded folk can surmise my great love of the various Oz books by L. Frank Baum. I read every single one. I read them multiple times. I loved them and the glorious world that Baum created in Oz. Since most people are at least somewhat familiar with The Wonderful Wizard of Oz because of the Judy Garland movie, I won’t really talk a whole lot about that series. Except I do want to promote the Oz: The Great and Powerful movie coming out next year and how I personally think that while they gave Ozma (me) zero love even though she (ME!) is the rightful heir and ruler of the greatest land, that Disney should still invite ME to whatever premiere festivities that they have. I mean, I DO have my own Ozma of Oz trading card (Hey, I’m worth 1.99 Euros! That’s a whopping 2.50!) and all that jazz. I’m just saying. I’m special. So if you have any way to actually make this happen? Get hopping. Or else I’m gonna go get those flying monkeys. At any rate, I figure, where is the fun telling you about something you already know fairly well? So I’m going to tell you about this book that I checked out so many times from the local library that when they decided to sell it, the librarian actually called my house to let me know. Those robbers got so many late fees off of me because of this book. Seems like a good one for “The first book I ever loved…” though I’m not sure if it’s truly the first or not. Casper, Johnny, and Gwinny are sure they’ll never be happy again when their mother marries Jack, who is as mean as an ogre. To make matters worse, two obnoxious stepbrothers, Malcolm and Douglas, move in as well. No one—except the parents—seems happy. But when Jack gives a chemistry set to each group of kids, bigger problems take over. These are, it turns out, not your average chemicals. In one hilarious experiment after another, the kids discover they can fly, switch bodies with one another, and even disappear. If only they could figure out how to undo all of this. Are one combustible stepfamily and two explosive chemistry sets a formula for disaster? I cannot even begin to tell you how much I love Diana Wynne Jones and how sad I was when she passed away last year. Truly, one of the best children’s authors of all time crossed to the great writing desk in the sky and the literary world will never be the same again. For those of you less familiar with her works, that great Miyazaki movie from a while back, Howl’s Moving Castle? That was Jones’ book first. Harry Potter? Compared to Jones’ work, especially the Chrestomanci series. 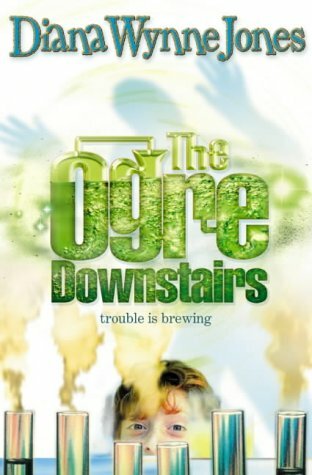 So what’s so great about The Ogre Downstairs? It’s set in “modern-day” England. Modern being the mid-70’s when she wrote the book. It centers around a blended family struggling to mesh together, proving a little more relatable than The Brady Bunch. And the basic plot? AMAZING. It starts with Jack, AKA “The Ogre” by his step-kids, bringing home chemistry sets. He gave one set to his kids and the other set to his wife’s kids, hoping that the showing of equality might offer the kids some entertainment with less arguing than providing only one set. The kids open the chemistry sets and everything appears normal, at first. Under the top tray of typical chemicals, the kids find things they’ve never heard of before in their lives. That’s where the fun began. Suddenly toffee bars come to life, they fly and escape the house to hit up the local dance club, and various other magical mischief. It starts off as the step-siblings try to best each other or make life worse for each other, but soon they bond as they try to figure out what’s going on. My dad worked as a nuclear chemist growing up and he gave me a chemistry set. I gave him this book and said, “Dad, I want an alchemy set. It’s way cooler.” He typically chuckled at me. I credit my love of this book for why I got an A+ in my high school chemistry class. Obviously, it has NOTHING to do with my dad. Right? Ok. Maybe just a skootch. The book is definitely geared towards teenagers, but I read this book a few years back for nostalgia. Totally held up in my eyes. I don’t care how many years young you are, read this book and enjoy it. I love this book. So. Very. Much. There are very few books I’ve read as many times as this book. I might even ask to be buried with it.